Lands' End Hits the Road in Iconic "Seagoing™ Duffle on Wheels" | Lands' End, Inc.
Home Page / Investor Relations / Lands' End Hits the Road in Iconic "Seagoing™ Duffle on Wheels"
DODGEVILLE, Wis., Aug. 22, 2018 /PRNewswire/ -- Lands' End is bringing back the iconic duffle bag in a big way. As part of the Lands' End Heritage Collection product launch, the company converted two Airstream trailers into larger-than-life Lands' End Seagoing Duffle Bags that will travel through the company's home state of Wisconsin. 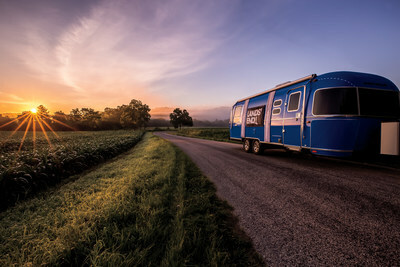 The three-month Heritage Tour will celebrate Lands' End's deep Wisconsin heritage and classic, popular products by exploring the state's well-loved events and attractions, and by interacting with brand fans along the way. "We are proud of our rich Wisconsin roots as well as our timeless, high-quality products that are part of the DNA of the company," said Jerome Griffith, president and CEO of Lands' End. "By kicking off the Heritage Tour at one of Milwaukee's historic landmarks, the North Point Lighthouse, we are giving a nod to our past while also looking forward to the future. This ongoing campaign is a way for us to take pride in our history while connecting with current customers and meeting new brand friends along the way." Lands' End will officially kick off the Heritage Tour on August 22, 2018, at Milwaukee'sNorth Point Lighthouse. The event, in partnership with North Point Lighthouse and the United States Lighthouse Society, is celebrating Lands' End's ongoing commitment to lighthouse preservation by supporting the restoration of North Point Lighthouse's South Ravine Trail. This project will connect the lighthouse property's South Ravine Trail with the city's lakefront path to better serve lighthouse visitors and the citizens of Milwaukee. What's more, it will help protect our beloved Lake Michigan from pollution and runoff. This partnership marks the fourth restoration project as part of Lands' End's Lighthouse Initiative since 2014. Event attendees will have the chance to shop the new Lands' End Heritage Collection, take photos in the photo booth and enter a sweepstakes for a chance to win a road trip in the Lands' End Heritage Tour Seagoing Duffle Airstream in 2019. Lands' End has been creating apparel and accessories of exceptional style and value since 1963 and the Heritage Collection reflects beloved favorites inspired from the archives, but designed for today. "Lands' End has a simple philosophy: make products with purpose that look and feel great," said Griffith. "The Heritage Collection embraces all our brand favorites from the Squall® Jacket, the Rugby, and the Drifter™ sweater to our iconic Canvas Tote and Seagoing Duffle. These items are the cornerstone of our brand story, designed to capture the spirit of enduring, good-looking style and quality, all with two simple words: Guaranteed.Period.®"